At Chotchkie's style restaurants, I love to order these things. They usually come dripping with grease, and the establishment does everything it can to avoid showing you the nutrition information, because, no matter how delicious they may be, if you saw the fat content, you would never order them again. 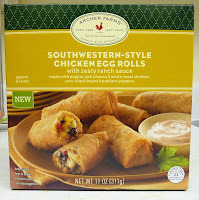 From Archer Farms, it's a similar experience, but they're not quite as unhealthy, and they're not quite as tasty. The egg roll shell came out of the oven crispy and flaky. I felt that the chicken wasn't very flavorful, but the other ingredients kind of made up for it. I definitely tasted the corn and black beans—probably the two most healthy ingredients. 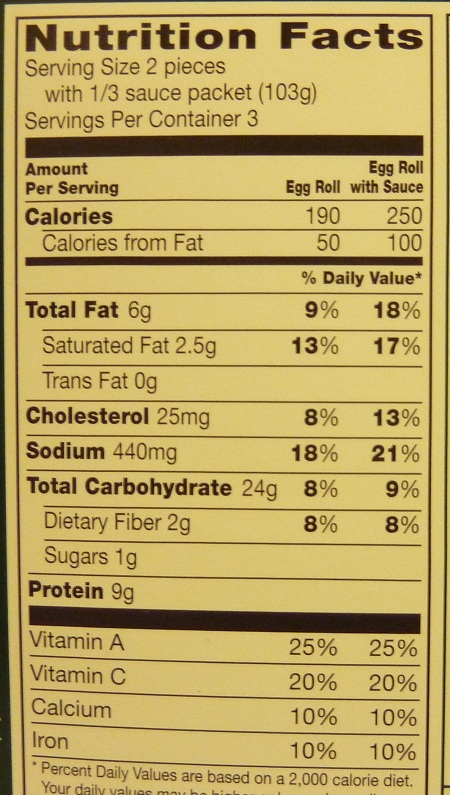 I often wonder if someone could devise one of these egg roll appetizer dealies with low fat and mostly veggies that could compete with the flavor of one of these heart-stopper appetizers. Another saving grace of these snacks was the zesty ranch dipping sauce. To me, it tasted almost like a spicy mayo, rather than ranch, but the little spicy zip it had was good enough for a thumbs-up from me. Many of these frozen appetizers show a dipping sauce on the package, but they don't actually include it in the box. Fortunately, that's not the case with these southwestern goodies. At $4 for half a dozen, it's a little steep, but you'd pay double that if you were dining out. 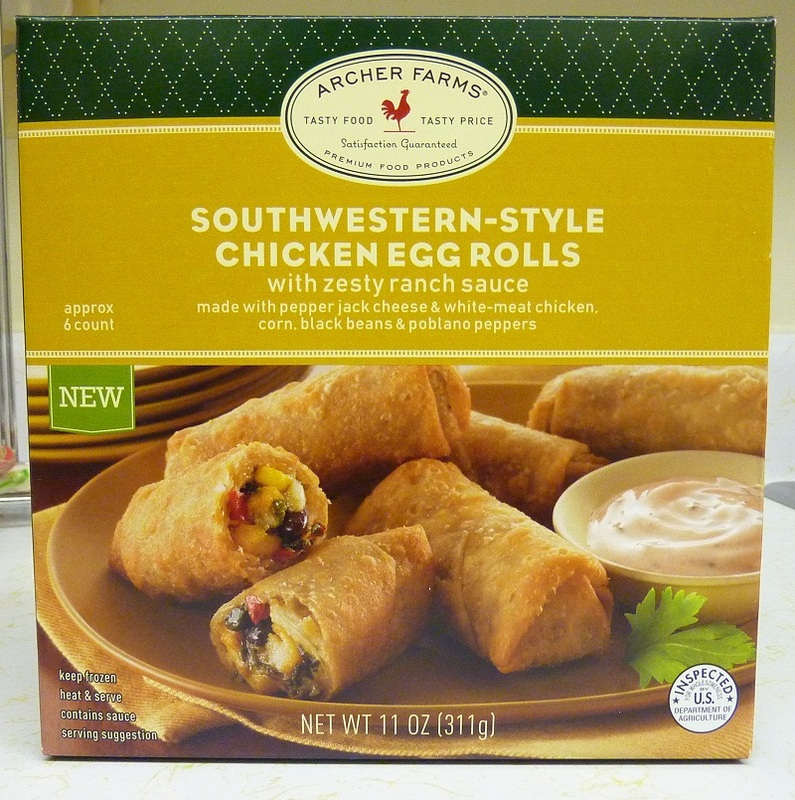 All things considered, I would think about buying these again, but I probably won't any time soon, because I really want to try all of the other frozen snacks that Archer Farms has to offer. I'll give these egg rolls 7 out of 10 stars. My wife and I just tried these and they were tasty... I scrapped the dipping sauce and just used some regular old ranch dressing. They are not the best I have ever had. But for the price and ease of just popping them in the toaster oven I will be getting these again! I would say a 7 out of 10 is a good gauge! Cool. I didn't even know if they still sold them. Thanks for your comment! I was really looking forward to these until I bit into one of them and was disgusted with the taste and texture of this "bad quality" what they call an egg roll. It's bland re-fried beans (where's the chicken} with corn all wrapped up in a flour tortilla like wrapping. 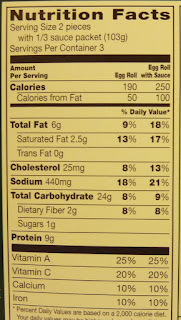 It's unfortunate that this is even allowed to be called an "egg roll" because it is nothing like it. Total "trailer" food! There aren't any re-fried beans here, and I'm pretty sure this product isn't even available any more. Not sure what you're talking about!